I admit I get a little carried away with the nautical theme at our lake house. But with so many cute and fun options, who can blame me? 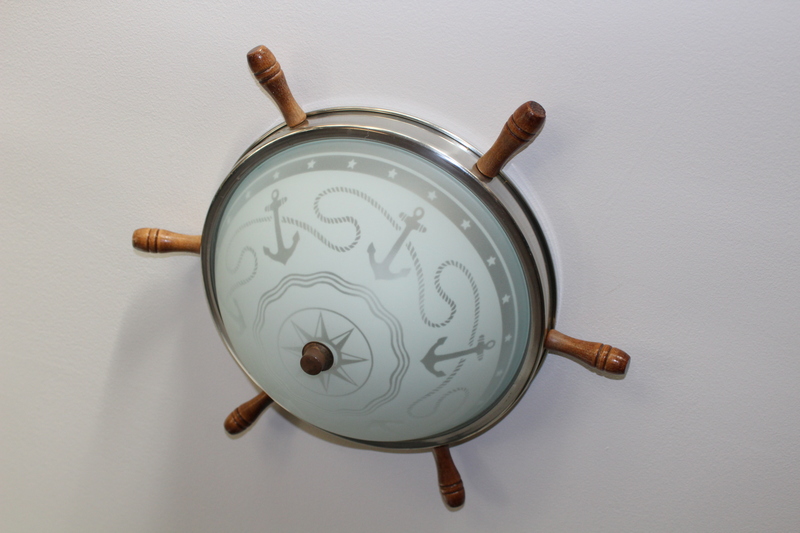 I scoured the internet and stores looking for cool nautical light fixtures…. This light fixture is in the Bunk House in the basement. Fixtures like this in mint condition go for well over $200. (Obviously I wouldn’t pay that much for a light fixture.) So, I ended up buying two of them so I could mix and match parts. They were both red and both were missing a few of the brass balls. So I put all of the balls on the red one and bought a small little anchor and painted it red to match and hung it from the hook in the middle of the glass globe. I love the compass detail. This little cutie is at the foot of the stairs in the basement. I painted the base black. I love the little ship wheels and roping etched on the glass. We have four ceiling light fixtures in the basement but at the time I only had two nautical lights so we had our electrician install them for us. Recently I found two identical lights so I will have those installed as well. This is one of them. I can’t believe I actually found 4! This little light hangs in the basement bathroom. The plug doesn’t actually work but I liked the brass and sea serpent shape and the shell at the top. I bought the two glass shades. They remind me of fish scales in the detail. This fellow started as a lamp but got broken in transit. He was so inexpensive that I didn’t bother to return him. I threw away the lamp parts and kept him as a decoration. His little dog is sweet too. I think I’ve cornered the market on nautical lights! Thanks for stopping by! Have a wonderful Thursday!